May looks to be as busy or busier than April so in an effort to keep what little sanity I have, I’m going to keep my images thumbnail-sized! Handmade journal, Strathmore 500 Mixed Media paper, 7.5 in. x 15.0 in. spread. 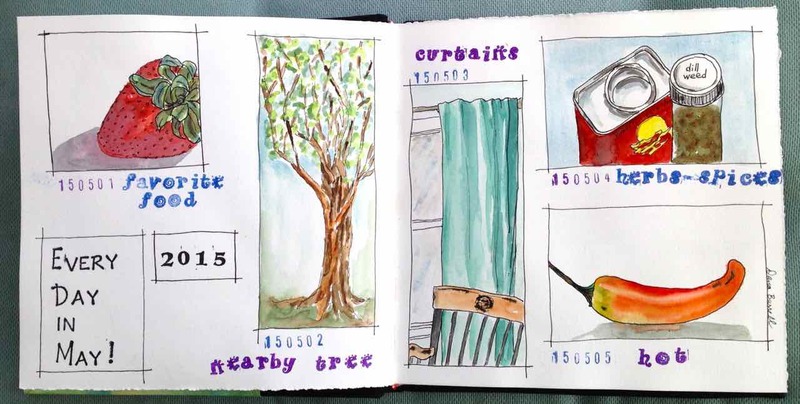 This entry was posted in EDiM2015 and tagged Curtains, EDiM, Favorite food, Herbs, Hot, ink and wash, Spices, Tree, Watercolor by Dana Burrell. Bookmark the permalink. Ahaha cool! : ) Maybe I ought to do that ~ when I press too hard with my Sharpie ink marker, I go through the other page and waste a sheet. So saving paper is a good thing and thumbnail size would do the trick.